In October 2017, fashion history fans saw a long-held wish come true: the inauguration of a Paris-based museum dedicated exclusively to the life, work and enduring legacy of legendary French fashion designer Yves Saint Laurent. Housed at the Fondation Pierre Bergé-Yves Saint Laurent, which opened in 2002 within the former premises of YSL's haute couture house, the new museum marks a new chapter in the Foundation's work. While it has held several temporary shows and retrospectives on the iconic trendsetter in years past, the shift to "museum" makes the project a more public-facing one. The exhibition space has been doubled, and architects and designers came on board to transform it into a uniquely curatable venue better suited for the general public. For anyone wishing to learn more about the iconic designer—regardless of whether they're a dedicated fashion junkie or simply curious about the history of French haute couture and YSL's considerable contributions to it—the museum's in-depth and beautifully curated temporary exhibits will plunge you straight into the designer's iconic world. When St Laurent passed away in 2008, many in France deeply mourned the loss. Here was a designer who was widely cited as founding modern fashion as we know it. Not since Coco Chanel liberated women from the strictures of corsets in the early 20th century had a creator come along to so radicalize what women's clothes were capable of being and expressing . Born in Oran, Algeria (then a French colony) in 1936, the young Yves dreamed of being a fashion designer from a young age, escaping from the pain of being bullied by classmates by creating an elaborate fictive world in which he owned his own couture house on the elegant Place Vendome in Paris. That dream would largely come to fruition. In 1955, the young YSL took up a job as Christian Dior's assistant in the French capital. It wasn't long before he was put into the designer seat and given a hand at making his own pieces; after Dior died in 1957, YSL took up the reigns at his house and designed his first collection for the brand. An initial stunning success was followed by the house taking a financial dive under the young designer's management; at only 21, YSL was in the public spotlight, but not in a good way. A breakdown ensued. Meeting Pierre Bergé, his future partner in both life and business, marked a crucial turning point for the designer. Bergé, a canny entrepreneur with connections in both the art and fashion world, teamed up with the young Yves to give birth to the YSL fashion label — a coup that would prove ingenious at a time when popular culture was shifting away from the conservative 1950s and into the colourful, irreverent and experimental '60s. YSL not only channeled the quirky and playful spirit of the decade, he also helped to create it with his avant-garde but still mostly wearable collections. Art and pop culture showed up throughout his couture designs, from Piet Mondrian-inspired shifts and pop-art infused dresses to collections drawing from the cultural traditions of Morocco, India and Africa. Perhaps his most iconic looks, though, were those aiming to liberate women from the dull confines of traditional femininity: tuxedos, trouser suits, and his signature "Le Smoking" suit are all permanent parts of fashion and social history. Those styles redefined what womenswear might look like — not to mention how women were "allowed" to move in their clothes. While most women, of course, couldn't afford the haute-couture price tags, YSL's designs influenced how clothes were made and sold at all price points. His enduring legacy as one of the 20th century's most influential designers is difficult to measure. Opened with great fanfare in October, the inaugural show at the museum runs until September 9th, 2018— giving visitors plenty of time to see it. Do make sure to reserve tickets in advance, however; the exhibit remains quite popular with both locals and tourists. Held in the same rooms where YSL's boutique and workrooms once stood, the inaugural connection brings together 50 haute couture designs from different collections, as well as sketches, photos, films and accessories related to these. Designed to offer visitors a succinct overview of the major periods and themes in YSL's work, some of his most iconic pieces and designs are present, from the safari jacket to the trench coat, Mondrian dress and the aforementioned "Le Smoking" suit. Some of the more colorful and experimental pieces come out of the designer's fascination with the style and cultural traditions of Morocco, China, India, Russia and Spain; the visit is organized partially around clusters of couture pieces designed with these cultural traditions in mind. Finally, two additional rooms in the exhibit offer a more in-depth look at the designer's personal life and work process. The first focuses on the passionate, tumultuous but devoted partnership between YSL and Bergé (the latter died in September 2017). The "technical cabinet", meanwhile, gives visitors an inside peek into how different elements in the designer's haute couture creations were sourced and used, from feathers to leather, and offers insight into the complex collaborations between artisans and fashion designers. The first temporary exhibit following the inaugural show, running from October 2018 through January 2019, will focus on YSL's Asian inspirations, juxtaposing both his iconic and more avant-garde creations alongside important works of fine art from Asia. See this page for information on other forthcoming shows at the museum, and details on how to buy tickets. The museum is located in the quietly chic, mostly residential 16th arrondissement (district) of Paris, in YSL's former design workshop. Make sure to check out the many nearby modern art museums and the Palais Galliera, which houses Paris' excellent museum of fashion history. The museum is open from Tuesday to Friday from 11:30 a.m. to 6 p.m., and weekends from 9:30 a.m. to 6 p.m. Last admission is at 5:15 p.m. Closed Mondays, as well as on December 25th, January 1st, and the 1st of May. The galleries close early at 4:30 pm on December 24th (Christmas Eve) and December 31st (New Year's Eve). Late-night openings: On the third Friday of each month, the museum remains open until 9:00 pm. Last entrance is at 8:15 pm. Admission prices: See this page at the official website for current rates. The museum offers free entry to children under 10 years old, disabled visitors and one accompanying person, and students of art history and fashion (upon presentation of a valid student card). Accessibility: The museum is fully accessible for most disabled visitors, who are admitted free of charge to the museum. Visitors may request a wheelchair by reservation; contact the staff by telephone or at contact@museeyslpariscom. Modern Art Museum of the City of Paris: an essential stop for contemporary art fans, this municipal museum's permanent collection is entirely free; also make sure to see the temporary exhibits at the adjoining Palais de Tokyo, and take in the sweeping views of the Eiffel Tower and the enormous expanse known as the Trocadero from the outside terrace joining the two museums. Palais Galliera: This opulent mansion houses the Paris Fashion Museum, another must-see space for anyone who knows that fashion history and social history have many intertwining threads. 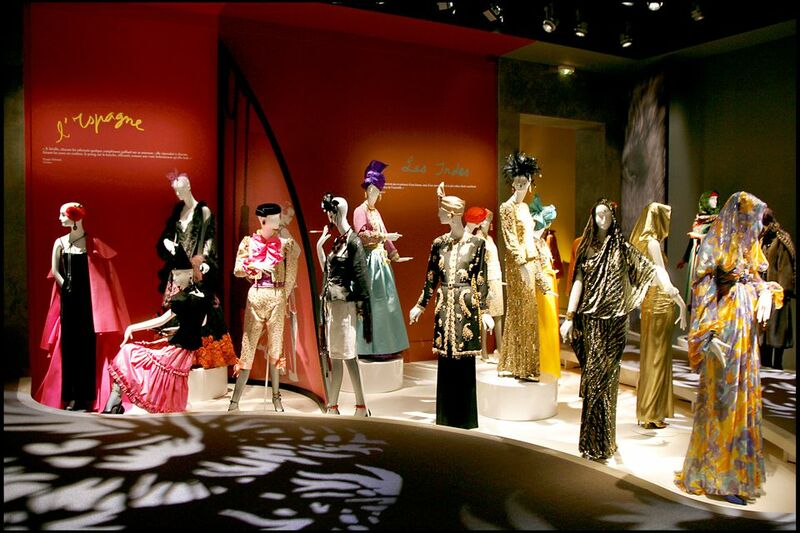 Fascinating temporary exhibits have focused on the couture house Balenciaga, style trends from the 1950s, and the Franco-Egyptian diva Dalida's influence on fashion and popular culture. The Avenue des Champs Elysées: While it's not right around the corner, a 15-minute walk or short metro ride will get you onto the world's most famous avenue, with the grandiose Arc de Triomphe at its summit. You may also wish to explore streets such as Avenue Montaigne, famous for its haute couture boutiques and general chic.